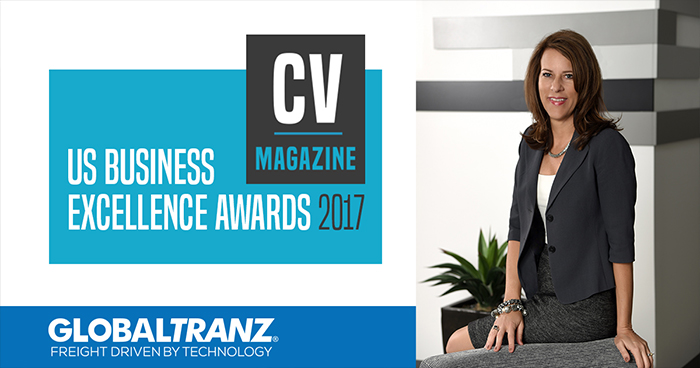 PHOENIX – December 19, 2017 – (BUSINESS WIRE) – GlobalTranz Enterprises, Inc., a leading technology-driven freight management solution provider, today announced its CFO Renee Krug has been named the 2017 CFO of the Year Arizona by CV Magazine Corporate Excellence Awards. The Corporate Excellence Awards recognizes executives for their outstanding business performance and commitment to game-changing innovation. Krug was honored for leading GlobalTranz to achieve record-setting financial growth and profitability in 2016 and 2017, completing four acquisitions in 2017, and effectively preparing GlobalTranz for future growth. CV Magazine selected winners based on the individual’s business accomplishments, client recommendations and testimonials, commitment to continuous improvement, previous accolades and achieved growth for their organization. Krug has led GlobalTranz to significant growth over the past 12 months, leading the acquisitions of Global Freight Source, Logistics Planning Services, Worthington Logistics and Apex Logistics. Delivering consistent growth, GlobalTranz recently announced its 2017 Q3 earnings, reporting record revenues up 42 percent year over year. As CFO of GlobalTranz, Krug is responsible for mergers and acquisitions, financial reporting, banking and treasury, accounting, tax, procurement and human resources. Krug also provides strategic vision, champions process improvement, drives margin improvements, implements cost reduction initiatives and develops programs benefiting GlobalTranz’ employees, their families and the communities they serve. Krug brings 20 years of executive leadership and over 10 years of transportation industry experience. Prior to joining GlobalTranz, Krug was CFO and EVP of Clear Channel Outdoor North America, as well as Vice President of Finance & Corporate Procurement at Swift Transportation. Krug earned an Executive MBA from Arizona State University and a bachelor’s degree in accounting from Indiana University. Krug also completed the Wharton CFO Leadership program in 2013.